Courtesy of Joyner Fine Properties. Have you always wanted to live in the Fan but could not afford a house here? If so, don’t miss this opportunity to buy an affordable Fan home. 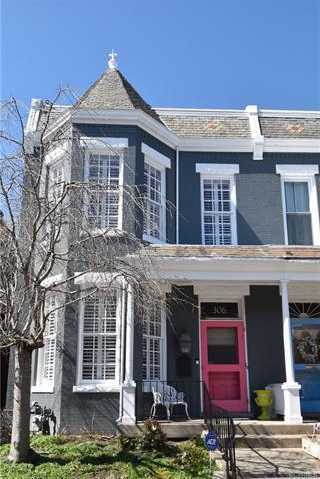 This adorable 3 bedroom row house is on a great block of the Fan- walk to many restaurants, parks and Historic Monument Avenue. First floor has Covered Front porch, Foyer, large Living Room with fireplace and bay window, large Dining Room, Renovated Kitchen with granite counters, gas stove, open shelving, and glass front cabinets; Breakfast or Family Room opening to large fenced back and side yard with Patio, half bath and laundry. Second floor has master bedroom with fireplace and HUGE walk-in closet, two additional bedrooms and bath. Beautiful outside spaces with covered front porch, fenced back and side yard with brick patio. And the alley to the left belongs to this house so off-street parking is included! Plantation shutters throughout, new paint, beautiful refinished hardwood floors, security system. Please, send me more information on this property: MLS# 1906633 – $549,000 – 306 N Meadow Street, Richmond, VA 23220. I would like to schedule a showing appointment for this property: MLS# 1906633 – $549,000 – 306 N Meadow Street, Richmond, VA 23220.